The holidays are here, and Taos is ready to trim the tree during Yuletide in Taos. With the falling of snow on candle-lit farolitos that line the streets in front of old adobe shops and homes, you are transported to another time and place. Here’s what’s on tap for November. The 35th annual Yuletide Arts & Crafts Fair features the area’s finest craftsman and artists. Shop from a variety of sculpture, paintings, foods, textiles, jewelry, pottery and more. 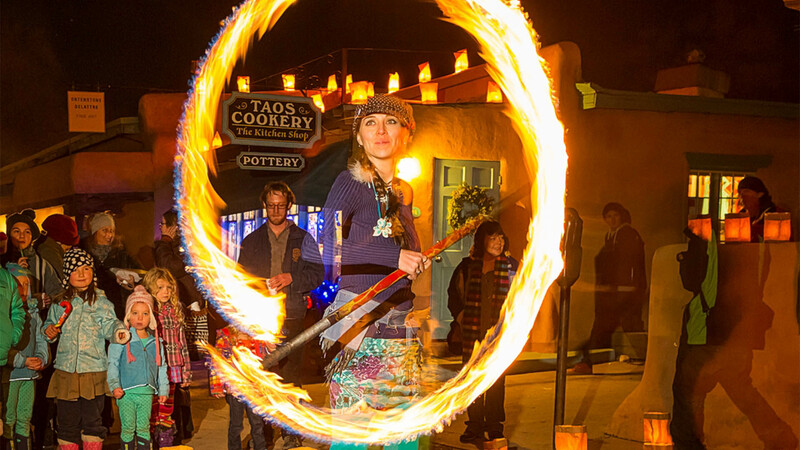 Nov. 25-Dec. 24, 11-5 p.m.
Taos’ famous pop-up store returns with affordable and beautiful handmade gifts by Taos artisans. Friday, Nov 30, 4-6 p.m. The 2018 Taos Holiday Season officially kicks off with the annual lighting of the town Christmas tree during the 31st Annual Yuletide Caroling and Tree Lighting. Come for the entertainment, and meet and greet special guests Mr. & Mrs. Claus (and even the Grinch!). Complimentary hot chocolate and cookies will be served.